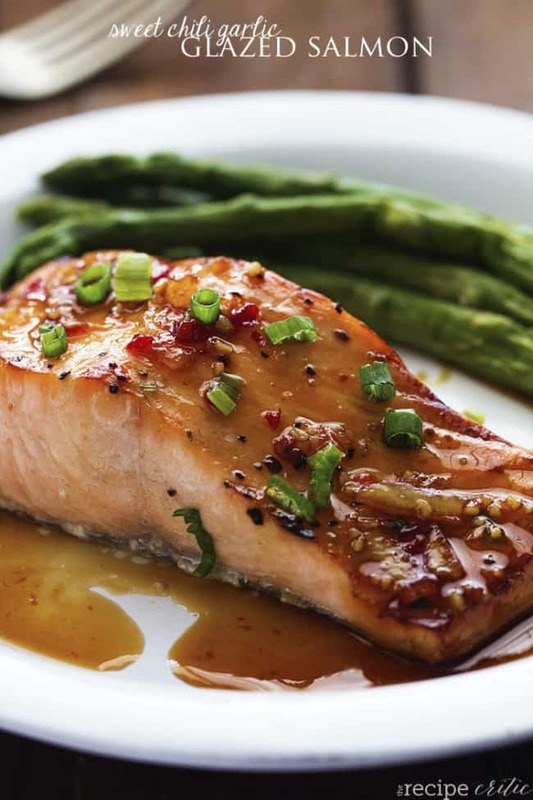 A five star salmon recipe with a delicious sweet chili garlic glaze on top. 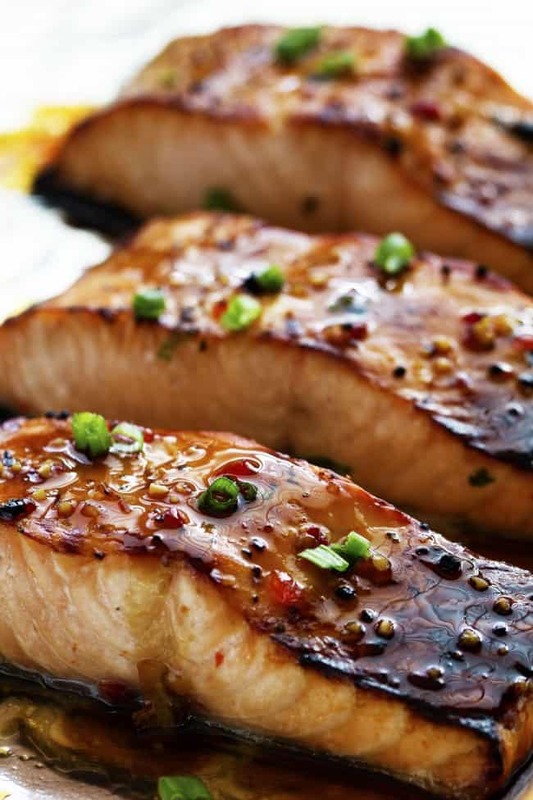 The glaze caramelizes the salmon as it broils and will become an instant favorite that you will make again and again! I am so excited to be an ambassador this year for The Salmon Council. If you have been following the blog, then it is no secret that I love salmon. I love working with companies that I am truly passionate about. Salmon is such an important part of maintaining a healthy diet. February is American Heart Month and it is so important to add Omega 3 fatty acids to your diet. Salmon is perfect for adding in your Omega 3 fatty acids and it is also enriched with protein and Vitamin D. Did you know that adding in salmon to your diet can help to reduce cholesterol and lowers your risk of a heart attack by one third? Yeah, salmon is awesome. 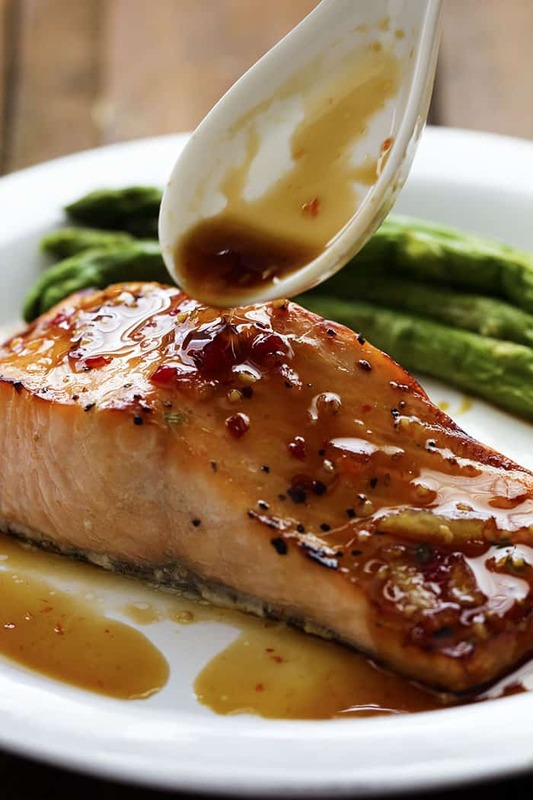 I declare this recipe the BEST salmon glaze ever. I made it three days in a row it is so good! Even if you aren’t a huge salmon fan, start with this recipe. The glaze is so good you won’t be able to get enough. Sweet Chili, soy sauce, orange marmalade, and garlic all come together to create one amazing glaze. These beautiful pieces of salmon soak up the marinade and get broiled in the oven. The marinade caramelizes on top while they are being broiled, creating an amazing crisp flavorful crust on the top. As soon as they come out of the oven, you drizzle those babies with more of the glaze on top. Trust me, you won’t be able to get enough! Just thinking about this salmon makes me want to make them again. Sigh. Did I mention that this is the BEST salmon ever? I have got lost in talking about the deliciousness of this salmon. 🙂 Perfectly flaky and the caramelized crust on top is perfection! A five star salmon that comes together with minimal ingredients and only takes about 5 minutes to cook. So easy to make my seven year old could probably do it! Speaking of my seven year old that hates all food…. he loved this salmon. Just sayin’. This salmon flaked perfectly with the fork. The flavor is amazing and it is such a good feeling to know that you are eating something that is so good for you and delicious! As you already may know, I made a goal to eat better this year and salmon has been a huge part of reaching those goals. Sometimes it is hard on a busy day to make a healthy meal. That is why I love to meal prep and I especially love these new product finds from Rubbermaid. The Lunchblox Salad Kit is my favorite! 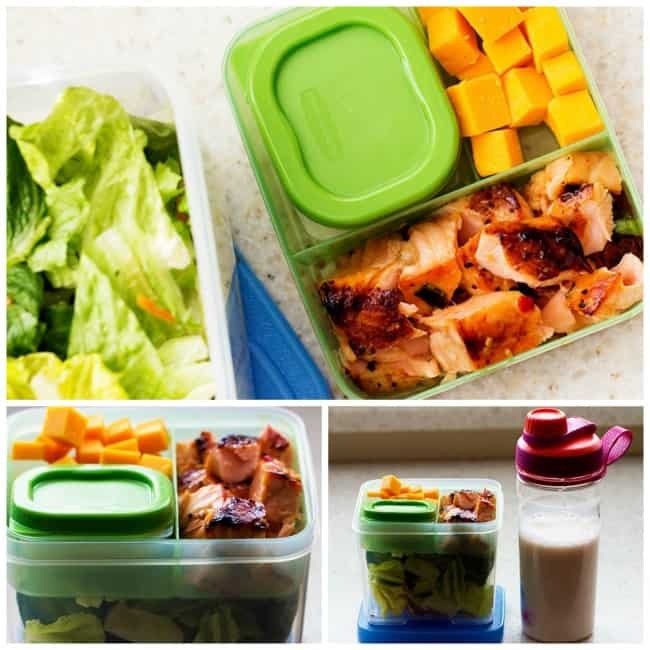 It is perfect for packing my salad, snacks and salmon inside. It comes in handy when I am on the go and even has a snap in blue ice to keep everything chilled! I have also LOVED my shaker bottle and it is perfect for my protein shakes before I head to the gym. Well without further ado, here is the recipe. Make it. You are going to love it just as much as we did! We have been searching for the perfect salmon recipe and now we’ve found it. This looks amazing! My mouth is watering!!! Can’t wait to make and EAT this amazing looking salmon! This looks delicious! I just want to confirm that you marinade the salmon skin down. Thanks! I’m gonna make it tomorrow!!! 🙂 Is there any specific sweet chili sauce which you recommend because I have seen using different brand sauces yields different tastes. Thank you. I use any of them. Right now I am using Harris Teeter brand. Sounds delicious and EASY! Pinning, and I will try this for sure! Made this tonight. It was very delicious, the flavours were amazing. Glad to have found the recipe! There’s sweet and salty soy sauce, which one did you use for this recipe? I used regular. But I am sure low sodium would also work. Alyssa, I’m having a party & would like to know, if I can I make this the night before? This looks great. I’ll try it this week! Have been looking for a good salmon recipe! I’ve never bought sweet chili, so I don’t know what it is. Very anxious to try this! If I don’t want to broil…what would the baking directions be? I just baked them at 425 degrees for about 10 minutes. This was awesome! The only comment I have is that the “Total Time” should really include the marinating time. I glanced at the time requirements and the ingredient list before going to the store, and had planned to make this for dinner last night. I didn’t realize that it had to marinate for an hour, so I did not start in time to serve my kids at a reasonable hour. So we had it tonight instead. But in terms of flavor — it was amazing and the whole family really enjoyed it!! We will definitely make this again. Making this tonight. Except we like salmon cooked medium – not opaque in center. 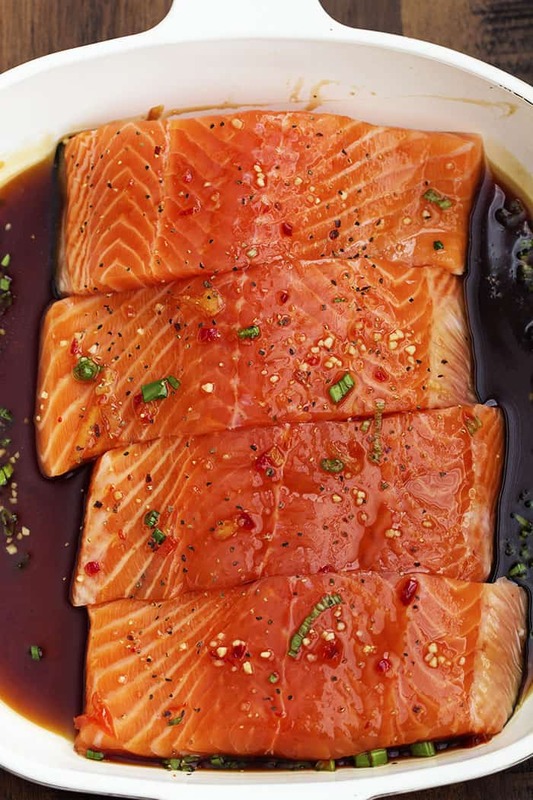 Got some sockeye to try out with this marinade – love the sweet chili sauce/marmalade combo! Thanks! This was amazing! My husband who does not usually like salmon had 2 helpings!! Will definitely be making this again and again and again!!! Thanks do much for passing along!!! I agree to add the marinating time to prep time as we ended up eating really late! Also I believe it needs to say 1 1/4 C Sweet Chili Sauce? This recipe is a great mix of flavors – thank you! Did you bake them in the same pan you marinated them in? Thus recipe sounds so delicious! I bought asparagus to serve along with it, any recommendations on how to cook it? Never made asparagus before. This is our only salmon recipe, since I can eat it! Great stuff. I only had chili garlic sauce one time, so I added honey, omitted minced garlic. Still good. You must have the orange marmalade, though. Wow this was sooooo delicious!!! I used Mae Ploy sweet chili sauce that I found in the Asian isle. Definitely a new favorite. Can this be cooked on the grill? If so what temp and how long? As I don’t easily find chili sauce where I live, what would you recommend me to add instead? That looks so good I may have to try it tonight. Thanks for sharing. I made this for dinner tonight for the husband & he loved it! 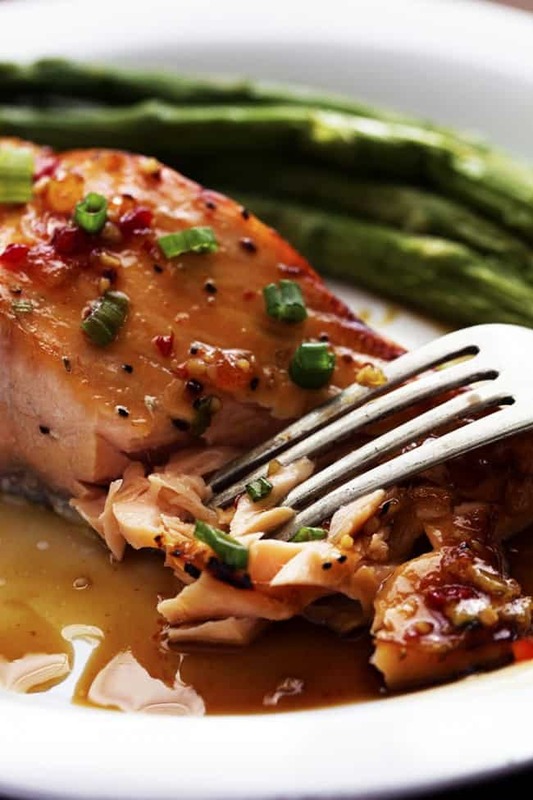 We are always looking for new salmon recipes & this one was amazing! Will be making this again soon! I’ve never made salmon before, but this looks fantastic and I can’t wait to try it. With such a long prep time though, could I marinate the salmon overnight? This was awesome. The first time I’ve made salmon and it turned out perfectly. My husband LOVED it! I make this dish all the time, and my boyfriend absolutely loves it! I usually bake at 425 and serve it on a bed of quinoa. The sauce is amazing and the salmon always turns out amazing! I made this last night and my family loved it. I didn’t have the orange marmalade but used peach preserves and I have to admit that this was good and I don’t eat salmon. Thanks for sharing. Do you know the calories of a serving? I looked through the threads and didn’t find my question. Is it sweet chil sauce (sometimes called sweet chicken chil sauce) or is it chilli garlic sauce? Just made this and it was seriously one of the best things I ever made! I had to adjust it a little – instead of orange marmelade, I juiced half of an orange and added a tablespoon of honey. I also used regular chilli sauce. Side dish was potatoes and broccoli. The flavours are so subtle and its just delicious. I will definitely make this again. Tried this recipe and it was very good my husband also had seconds. I don’t have a lot of time with having two small children 1yrs & 3yrs so I went with baking at 425 for about 20-25 minutes. I also used the entire jar of the sweet chili sauce which was about 1 & a half cups total. Also, I didn’t have the orange marmalade so had to use apricot jelly same amount. It tasted great still but I would still like to try with the orange instead but would use either to make this again as a regular for weekly meals. This looks delicious! Can you confirm whether it is 1/4 cup or 1 & 1/4 cup of the sweet chilli sauce? I assume the latter based on having some left to pour on top but please confirm! Hello, just curious which “chili sauce” did you use? You mean the asian Siracha or like Heinz chili sauce? This was so good! My husband and I are not salmon people but are trying to eat better and we both loved it. I saved some of the sauce and put it on my zoodles, it went really well together, thanks for the recipe! In one of your responses, you acknowledged the sweet chili sauce is 1 and 1/4 cups but you didn’t update the recipe, it still says just 1/4 cup. That being said, we made this tonight and delicious is an understatement!! We will definitely be making this again and again!! Made this for dinner last night and everyone loved it. It was super easy and delicious. Definitely a keeper!! I had to tinker. I made more marinade than needed, reserved it & then created a pan sauce by adding butter & red wine. I reduced it by a third & then spooned it on top. The butter gives it some body & mouth feel and the wine kicks up the flavor. It’s a win win. your recipes look amazing. I will be trying these very soon. I will let you know what I think of them when they are made. Thanks for sharing. This is THE BEST salmon recipe I’ve ever had! Love the flavor – even my grandchildren will eat it. This looks so good!! Could you marinate this overnight? Hi Alyssa. My roommate breaks my chops every time I make salmon. He says what no glaze? All I can do from not slapping him! I saw this recipe and said oh yeah, thats the glaze! I do have a question about the cook time though. It says prep 5 min cook time 1 hour 10 mins? oops, I cant see putting a piece of salmon under the broiler that long but I cant wait to try this recipe, it looks freakin awesome! What are the nutrition amounts for this? I am eating Keto. Anything else I could use if the orange marmalade and sweet chili sauce are high in sugars? For all nutrition information I use skinnytaste.com or myfitnesspal.com. These will help with following along with eating Keto! Thanks for following along with me. These were fantastic! Hubby says to put them on the repeat list-that’s quite the complement for him! !